For the past two years, Local 1300-Baltimore, MD, has been raising the alarm on serious safety concerns about track and other maintenance issues, but the Maryland Department of Transportation has ignored them. 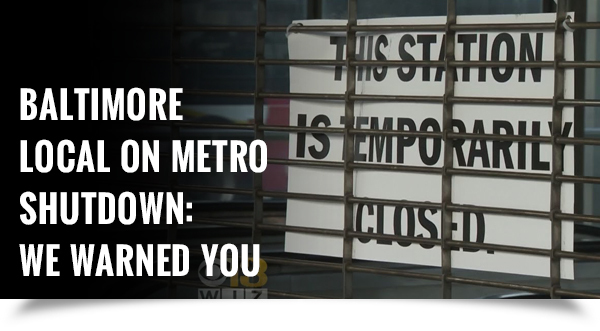 Now the agency has shut down the entire Baltimore Metro for up to four weeks. "It's like Baltimore doesn't exist to this administration," said Local President David McClure. Not surprisingly Governor Hogan passed the buck blaming the problems on previous administrations. The Local is calling for a hearing on MTA to hear what the agency is doing to address these issues and go on record about their safety concerns. Watch story. The hits keep coming, Toronto streetcar worker attacked? Not a week goes by that we don’t hear of a transit worker being assaulted by an angry rider. In Toronto, a TTC streetcar was helping a woman get onto a streetcar when a man allegedly stole a bundle of transfers from the dispenser. The operator was able to get the transfers back, but an altercation ensued. The assailant got angry, spit in the face of the operator and ran away. The police are still looking for him. Local 113-Toronto, ON, Financial-Secretary Kevin Morton said assaults on drivers and other TTC staff have become an epidemic. "We have people with post-traumatic stress disorder because they've been assaulted a few times," he said. Read more. “The tragic suicide of a New York livery driver, Doug Schifter, has highlighted the financial stress faced by taxi and livery drivers and should cause all of us to question the merits of the ‘gig economy’,” ATU International President Larry Hanley writes in a New York Times letter to the editor. “It isn’t just livery drivers like Mr. Schifter — who had to drive 100-hour weeks to make ends meet — or the owners of medallions plummeting in value who are suffering. Uber and Lyft pay their drivers poverty wages, and drivers lack health insurance and other necessary benefits…The gig economy isn’t cutting-edge; it’s exploitative and it’s ruining lives. Remember that when you open the app.” Read the letter. One year after driver’s death, little change: Winnipeg Local? Marking one year since Local 1505-Winnipeg, MB, member Irvine Jubal Fraser was tragically killed by a passenger on the job, a packed remembrance service was held and buses flashed “In memory of #521” Fraser’s badge numbers as a transit operator. The Local says progress in making transit drivers’ work environment safer has been slow. One driver said he doesn’t feel any safer heading to work now compared to a year ago. “I’ve been threatened myself on the job, but you do what you can. My family is definitely worried for me, scared for me. Every day I go to work and feel like you never know – today could be the day.” Read more. In recognition of Black History Month, ATU is remembering important people and events in the history of the civil rights movement and public transportation. This week we are remembering Granville Woods, an African-American inventor who made key contributions to the development of street cars, the telephone and more. Known as the "Black Edison," Granville held various engineering and industrial jobs before establishing a company to develop electrical apparatus. He registered nearly 60 patents in his lifetime, including a telephone transmitter, a trolley wheel and the multiplex telegraph. Read more. Alberta Locals 569-Edmonton, 583-Calgary, and 987-Lethbridge, took part in an innovative ATU training to learn new skills, hear from experts, learn about Canadian labour history, and take part in hands-on exercises to strengthen their Locals for the fights that lie ahead. 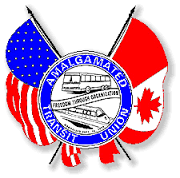 These and other innovative ATU training programs are a vital step in preparing our Locals for bargaining contracts, engaging our membership and galvanizing our riders into a potent political force. Contact your Local about attending an ATU training. Atlanta Local appeals decision overturning ruling to stop outsourcing MARTA Mobility? Calling the move a threat to the safe, reliable and accessible transit service for people with disabilities and seniors, Local 732-Atlanta, GA, is appealing a judge overturning a decision which required MARTA to stop outsourcing its Mobility paratransit service. “This Judge’s decision is bad for riders and our community,” says Local President Michael Majette. The Local called on the courts to overturn the Judge’s decision vacating the decision of the Board of Arbitration and order MARTA to bring its Mobility paratransit service back in-house. “This is about the civil right of all residents and visitors of Atlanta to safe, reliable and affordable public transit without regard for their age or disability,” Majette continued. Read more.